With some manual tweaking Blogger is now able to upload images so that they can be viewed. Herriman Saturday can proceed! 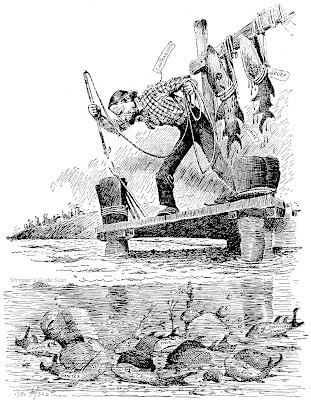 These cartoons ran on November 16-18 1906. The first two begin an ongoing chronicle of the Examiner's continuing hatred of the new government. 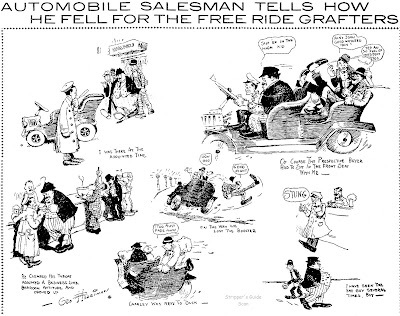 The third is an illustration accompanying a story about the bane of the automobile dealer's life, joy riders who pretend to be interested in buying a car just for the thrill of a test drive in the newfangled machines. Just a note to let you know how interesting these continue to be for me. Every Saturday, I get a glimpse into the history of comics, art, & America, courtesy of both you and George. Allan: Thanks again for the great postings. 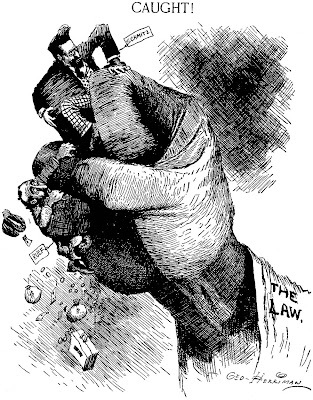 The first two cartoons refer to the graft prosecutions against Boss Abe Ruef and Mayor Eugene Schmitz of San Francisco. They were arraigned in November, so these early December cartoons must refer to that. Ruef was eventually sentenced to 15 years in San Quention, but served less than five. Schmitz was twice convicted of extortion, but it got overturned. He eventually made it to the Board of Supervisors. Thanks for the details Joe. Wish I'd had more time to read papers as I was making copies to understand the subjects of the political cartoons more fully. I really appreciate the explanations you and others have been adding! Today Blogger has a brand new bug that doesn't allow me to upload pictures properly, so let's do a text only post. Here's a group of interesting short news items from various 1952 issues of E&P. The biggest comic strip charac­ter in the country this week is undoubtedly "Gordo," created by Gus Arriola for United Feature Syndicate. The Arizona State Fair, now under way in Phoenix, features a 60-foot high figure of Gordo, along with his compan­ions, Pepito and Senor Dog, to keynote the Mexican motif of this year's fair.The giant display is constructed of wood, structural steel, plastic and wire, and supported by two telephone poles. Windshield stick­ers and other Gordo items will further promote the strip with fair visitors. Here's a strip guaranteed to last for just one year. No peren­nial tenant on your comic pages, this. Just 52 weeks-Jan. 5 to Dec. 31, 1953-and it's done. No Sunday pages either; just six re­leases weekly, in four-column width. The strip is called "Louisiana Purchase"-1953 is the 150th an­niversary of that historical event -and is the story of the 14-state region comprising the Louisiana Territory from its early discovery and exploration by Spanish conquistadores to its incorporation into the United States. All authen­tic history, lots of adventure and wrapped up in a humorous draw­ing style. Creator is John Chase, editorial cartoonist for the New Orleans States and author of the prize-winning narrative history of New Orleans, "Frenchmen, Desire, Good Children." The Register and Tribune Syndicate, which will distribute "Louisiana Purchase," suggests ample promotion opportunities for the strip in connection with schools and patriotic organizations and possible use in contest tie-ins. Joseph Shuster, the original art­ist-creator of "Superman," has de­veloped a new comic strip and is seeking a syndicate outlet, he an­nounced this week. The strip is called "Golly Galoo, the Magic Genie," and follows science-fiction fantasy lines, Mr. Shuster said. The William Morris entertainment agency has expressed interest in the feature as a tele­vised children's program. "Our South," a weekly two-col­umn cartoon panel, is offered for immediate release by the cartoon­ist, Henry McCarn, 428 Haw­thorne Lane, Charlotte, N. C. The panels will embody a hu­morous approach to the peculiari­ties and customs of the South. Mr. McCarn was formerly a staff artist on the Charlotte News, and has been a free-lance editorial cartoon­ist for the past two years. Three AP Newsfeatures comics -"Oaky Doaks," "Scorchy Smith" and "Modest Maidens"-will be available in third-page standard size color format beginning Jan. 4. They have previously been avail­able in tabloid mats, and appear in a tabloid readyprint section. A suit filed by Elmer C. Stoner, formerly artist on Enterprising Feature Syndicate's "Rick Kane, Space Marshall" strip, to restrain the syndicate from proceeding with the strip under another artist, was turned down by New York State Supreme Court Justice Aurelia December 17. The artist had contended that his dismissal and the continuation of the strip under another artist were violations of his contract with the syndicate. A cartoonist who be­lieves in doing his own selling is Walter T. Johnson, formerly artist on Enterprising Feature Syndi­cate's now defunct "Rick Kane" strip. Mr. Johnson has just launched Walter T. Johnson Features, Inc. at 1475 Broadway, New York City. First two features, slated for late March re­lease, are "Captain Johnny Fal­con," a space adventure strip, and "The Sundown Kid," a Western. Two other comic strips are planned for release this fall. Mr. Johnson will draw all four strips, sell, and write the contin­uity for "Johnny Falcon." The Western strip will be written by William F. Crouse, formerly as­sociated with "Hopalong Cassidy" television productions. A new comic strip from Mc­Naught Syndicate is "Johnny Comet," a daily and Sunday ad­venture strip with an auto-racing setting. Plot lines will be based on the life of speedcar driver Peter DePaolo, who is acting as technical consultant on the strip. "Johnny Comet" will stress rac­ing on speedways, safety on highways, and has the backing of safety councils in a number of cities where it is now appearing. Author of "Johnny Comet" is Earl Baldwin, screenplay and mys­tery writer. Art work is done by Frank Frazetta, 23-year old grad­uate of the Brooklyn Academy of Fine Arts and a comic book illus­trator since the age of 16. Vincent Fago, who started streamlining Herald Tribune Syndicate's "Peter Rabbit" strip when he inherited it from Harrison Cady four years ago, this week led the veteran strip into a new story line. Abandoned was the previous "realism" of talking animals in a nature setting. In its place readers found the first in­stallment of a series of phantasy adventures in "Doll Land" and "Backwards Land," "peopled" by stuffed dolls, galloping alarm clocks and freckled toadstools. To point up the change, one strip in the Sunday release for Feb. 17 was left in black-and-white, with readers invited to par­ticipate in a coloring contest. Stuffed "Peter Rabbit" dolls were offered as prizes. Though it sounds more like an advertising strip for male enhancement pills, Tiny Tinkles was, in reality, a long-running series that ran on that wonderful Chicago Daily News daily comics page. Gus O'Shaughnessy originated the strip on July 23 1903. It was a cute idea - take four rhyming words, one per panel, and make a gag out of it. The idea was obviously a favorite in the Daily News' bullpen because practically everyone who ever sat at a drawing board there took an occasional whack at it. O'Shaughnessy kept it for himself for the first two years, but after that the floodgates opened. From 1905 to the strip's final appearance on April 24 1911 a parade of cartoonists signed their names to it. Mostly it was done by scribblers whose names are beyond obscure (many deservedly), but the roll call also included Gaar Williams, Harry Hershfield and R.B. Fuller. Our sample above is from 1903. This one is a real oddball. The Yankee Rangers, which gives every impression of being an ongoing adventure strip was, for reasons lost in the mists of history, a closed-end strip slated for a six week run. According to Ron Goulart in The Funnies neither Andriola or the folks at King Features had any recollection of the reason for the creation of the strip. Andriola at the time was between jobs, having quit from Charlie Chan at McNaught and was in negotiations to start Kerry Drake for Publishers Syndicate. The temp job was a perfect way for him to keep active, but why King offered it to him is a mystery. The Yankee Rangers were a trio of military men recruited to go on a dangerous mission in the Netherlands. The six-week strip was full of action from end to end, and Andriola's best Caniff impression made for an eye-catching as well as entertaining strip. At the end of the six week run the Rangers sailed off into the sunset, never to be heard from again. Of the small number of papers that ran the strip (including the Butler Eagle, my wife's hometown paper) most started the strip on different dates. The earliest found is the Massilon Independent which started it on December 10 1942 (a Thursday). The intended first release date was more likely to be December 7th, and maybe that's a clue. Perhaps the strip was originally conceived as a memorial tie-in of some sort with the first anniversary of the attack on Pearl Harbor. If so it certainly went off track since the action is in Europe and doesn't refer to that event. Thanks to Cole Johnson for the examples reproduced above. With a name like Spellbound, you'd figure this strip must be about a witch or something. Nope. It's about romance. The heart in the logo is your tip-off. I only have a few samples of this one so I'm not even sure if our star couples were married or just dating. Brian Barling produced this short-lived Sunday and daily strip for King Features in 1991-92. I don't have exact start and end dates for it though (anyone?). These days Barling is an editorial cartoonist for the Christian Science Monitor and also produces cartoons about wargaming. Hello, Allan----My brother tells me SPELLBOUND ran from September, 1991 to March, 1992. It ran in 19 papers, some of the major titles being the Dallas Times Herald, The Deseret News, The Oregonian, The San Francisco Examiner, Seattle Post-Intelligencer, and, oddly, it appeared in both the the Syracuse Herald and the Syracuse Post-Standard.--Cole Johnson. Thanks Cole, and thanks also to br'er Mark! Barling had some good high-paying papers there, unfortunately not nearly enough of them! The Syracuse papers would split the monday to saturday strips and the sunday one. After a loooong layoff in the mystery strip listings, here's my list for letter M. Rather than rehashing what this list represents I refer you to this post that explains all. As usual I'm looking for proof that any of these features ran in U.S. newspapers. Proof must be in the form of tearsheets from a newspaper. For the purposes of listing features in the Stripper's Guide Index documentary proof is needed. If you don't have any samples you can scan or photocopy for me but do know where a mystery strip ran, please let me know the name of the paper and I'll try to get hold of the microfilm to verify it. Mark Tonra's bio page (http://tonra.com/mark_tonra.html) has no mention of "Jack And Tyler", so I presume it never got printed. But you could always ask him. By the way, while you're at it again, there are many comments on previous pages that should be incorporated into the lists. And an update on Tonra: even though he omits it in his own bio, there's an interview at http://www.astronerdboy.com/comic-strips/kiosks/advice/MarkTonra.htm where he says it was distributed by King Features in 1995-6, but sold poorly. Sorry for the red herring above. Re Jack and Tyler, Tonra told me it did run but he couldn't recall a paper I could check for it. So we're in a holding pattern until someone spots it. As to the comments, I read and respond to every comment as necessary and apply the results to the list as applicable. Could you be more specific as to what I missed? Did you see something that I should have followed up on? makes it sound like that paper would be a good place to check. As for "Jack and Tyler"; again no proof, but I have reason to believe that it ran in the Deseret News in the Spring of 1996 until it got cancelled. Bob Artley's feature is sort of a special case because there's no doubt it MUST have run somewhere. I've read and enjoyed his many reprint books of the material. Problem I see with Artley's feature is that I suspect it wasn't necessarily issued on a regular basis, and/or the cartoons may have been one part of a text feature (wither of which can take it out of SG indexing territory). Thanks for the link, I'll put this paper down as one to check if and when I get the opportunity. BTW, isn't it weird that newspaperarchive, with all those little midwest papers, can't seem to find a single one that ran Artley? As for Tonra's strip, I'll add Deseret News to my research list (the list that rival's Santa's for length). Afterworld - I had corresponded with Todd Showalter before embarking on the mystery list and never had any luck getting the name of a newspaper or sample tearsheets from him, so you're right, I didn't follow up on his msg. Either he's shy or doesn't have newspaper clients. Todd, if you're out there, help us out buddy! Babs and Aldo - oops, I did follow up on that one, but then forget to mark it off the list. It ran in the Deseret Morning News. Taken care of now. Bachelor Party - Charles Brubaker gave me a list of papers to check. I haven't had an opportunity to look at any of them yet. Should have on my last trip to the Library of Congress but time was short and I had a lot of material to cover. Berenstain Bears - when Cole Johnson talks you bet I pay attention ... but I should have followed up. I assumed that Cole got this nugget from his brother Mark, who works at King. Am I right Cole? Can you give us any details? Everybody's Business - it was on Copley's website, but I still haven't found it in a paper. Copley features are notoriously hard to find - most of them don't even run in Copley-owned papers. Very weird syndicate. Ffarm.com - It's on my research list but I haven't had the opportunity to look at the Hartford Courant yet. Inter-library loan, especially with the volume of material I need to look at, is a long, slow process. Greg-Jim Humorous Adventures - W. Morgan said it probably ran in the Toronto Star. Probably did, but I'm looking for appearances in U.S. newspapers only. In Their Own Words - This msg came in while the blog was inactive, on hiatus while my wife was dealing with some major health issues. I'll follow up on it now. "A MAN NAMED HORACE", MILLIE" as well as "SCORER" LAUGHTER CARTOONS","THE PERISHERS" and "GARTH" were series from the London Mirror that NAS had the syndication rights for America in the 90's. But did they manage to sell them to anyone in the US? I don't even recall seeing them in the weekly syndicate books of that era. I'll add it to my 'papers to check' list. Of course, this doesn't mean it actually made it to a paper. Would Creator's Syndicate have any contact information for him or any of the others? Artley, Bob. Cartoons: From the Newspaper Series Memories of a Former Kid. Ames, Iowa: Iowa State University Press, 1989. 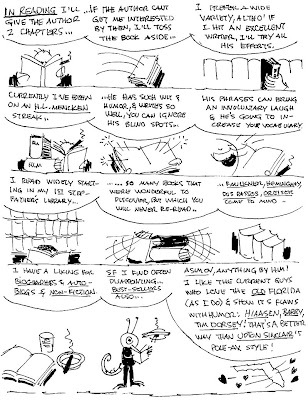 Since most of his books seem to be published by Iowa publishers, perhaps the strip appeared in Iowa papers? Re Mr. Housewife, glad to have the dates, now all I need is some proof that it did indeed make it to papers. Anyone? Re Artley's feature, those points were covered in the comments above yours. It's official,in the 1990's the London Mirror titles were syndicated by North America Syndicate but ONLY for non- North American papers. It's a funny world. Hello, Allan-----JACK AND TYLER ran daily from 9-18-95 to 4-28-96, and Sunday from 9-24-95 to 5-5-96. It was in about 20 papers, including the DALLAS MORNING NEWS, the KANSAS CITY STAR, and the DESERET NEWS, according to my brother Mark.-----------Cole Johnson. Thanks much for checking with Mark on this strip. Now all I have to do to put this one to bed is get hold of one of those papers. Unfortunately easier said than done because few libraries will do inter-library loan on 'current' (!) papers. For instance I just got a rebuff from CT on the Hartford Courant -- they're happy to loan out older film, but the newer stuff is off-limits. Sigh. If only we had blog readers in these cities who were willing to do a little local library research in exchange for fabulous goodie boxes we'd be all set. Am I begging hard enough folks? I wrote Millie, one of the London Daily Mirror strips you're asking about, from 1990 through to 1995. Did we get published in the States? The answer is yes, but it's a yes with an asterisk against it. Around 1994/95 a thinly localised version of the Mirror was printed in the States and distributed in areas with high populations of ex-pat Brits. I can vouch for this as I bought a few copies in San Francisco on holiday one year. So that's my yes with an asterisk. Thanks for the very interesting info! Regarding King Features, they operate North America Syndicate so they're really the same thing. I'm completely at a loss regarding your prison fan base. I know the US incarcerates a greater percentage of our population than any other country, but I don't think they're publishing their own papers with syndicated strips ... yet. According to this August 11, 2008 article in the Worthington Daily Globe, Bob Artley seems to be residing in your neck of the woods. Well, at least in your state. Here's a strip i haven't seen mentioned anywhere: "Mr Nugent." On weekends, the NY Post ran a kid's strip named "Mr Nugent's *"
The strip included puzzles, picture games, etc. I remember enjoying it, but when i Googled it, I found no mention anywhere. Maybe I've mispelled it, but I don't think I have. The feature you're thinking of is "Uncle Art's Funland" by Art Nugent. My Stars ran in the Deseret News in 1976. It was a parody of Star Trek; in fact, the spaceship looked like the Enterprise. I checked a representative set of 1976 dates of the Deseret News in the Google archives, find nothing of that description. I rechecked newspaperarchive though, and did find My Stars by Ken Bruns in th Charleston Daily Mail. It was an astrology cartoon. Bob Artley passed away on Ocyober 21, 2011. The Worthington Daily Globe obit makes it sound as if Memories of a Former Child was exclusive to that paper. "One of his most popular editorial features was a series of cartoons based on his memories of growing up on a farm near Hampton, Iowa. “About once a week, as relief from the world and politics and so forth, I started doing this ‘Memories of a Former Kid,’” recalled Artley in a 2007 feature story in the Daily Globe marking his 90th birthday. 'I think, actually, what happened was they had a special (section) they’d put out once in a while, a farm special, and I did some drawings that were like ‘Memories of a Former Kid,' and we called it that in this one issue, and that’s where the name started. Then I started doing a weekly cartoon to replace the editorial cartoon.'"